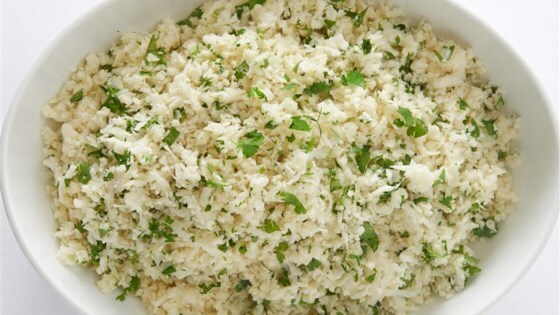 "Grated cauliflower stands in for rice in this flavorful, grain-free side dish." Grate cauliflower florets or pulse in a food processor until it resembles rice. Place grated cauliflower and water in a microwave-safe covered dish. Cook cauliflower in microwave on high until tender, about 7 minutes. Stir lime zest, lime juice, cilantro, and butter into cooked cauliflower until well blended. This just didn't taste good at all - much too strong in the cilantro and lime. This is really good. I just cook the cauliflower rice in a skillet with coconut oil instead of butter. Finish off with some Siracha chili sauce for a nice kick.